It’s impossible you haven’t read or heard about this study! But, are we? I mean, we’re talking about a study with N=8 subjects?! Moreover, no one questions our exposure to the sub-millimeter sized particles and the fact that we actually seem to poop them out would, after all, suggest that they do not accumulate in our bodies – that’s good news, isn’t it!? When I posted the “if you poop it out, that’s good news”-hypothesis rather mockingly on Facebook, I still thought that I would probably never hear about the data from the as-of-yet unpublished pilot study, again. Turns out, though, few people seem to look at the whole story as rationally and calmly as the first responders to my Facebook-post… long story short, and to answer the question from the headline: It is obvious that people do care. So much so, in fact, that I’d bet that people from Japan to Island and Syberia to Cape Hope are checking their stools for microplastics right now! 5 μm polystyrene microplastic induced bile acids metabolism disorder in mice. 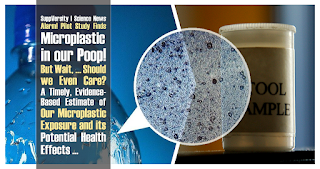 …the microplastic particles the scientists found in the their “poop analysis” were 10-times the size of the polystyrene microplastics in the Jin et al. study, i.e. 50µm not 5µm! As we’re going to see later, this isn’t necessarily good news, though. For one, the scientists’ presentation of the results at the UEG Week indicates that 50µm was simply the limit of detection in the Austrian study. It is thus well possible that the researchers simply missed the presence of the smaller particles, and the real concentration of microparticles in the poop of their eight non-vegetarian subjects was in fact significantly higher than Schwabl’s report would suggest. And, what’s even worse, there’s also the remote possibility that there were no <50 µm microplastic particles in the subjects’ poop, because these particles were small enough to either accumulate in the subjects’ gut lining or to pass right through the possibly already impaired barrier and into the bloodstream, instead of being excreted again as my initial hypothesis would have it. Yes, smaller seems to be worse, but 50µm is already pretty small – Should we be frightened? Figure 1: In a previous study, Jin et al. have already proven that “larger” microplastics, such as the ones that were found in the subjects’ stools can change the microbiome of fish and mice – however, an increase in markers of inflammation was observed only for the smaller, 0.5µm polystyrene molecules (Jin 2018a, b). At this point, it is not clear which of the two scenarios – if any – describes what was really going on in the subjects’ guts and circulatory system. I still have to admit that the results of several studies from Jin’s laboartory at the Zhejiang University of Technology previous study (e.g. Jin 2018) suggest that you don’t have to break microplastics down to an actual micron (=1µm) to see potentially pathogenic changes in the microbiome of both, mice and zebrafish (see graphical summaries on the right). In their animal models, the scientists from the Zhejiang University of Technology in China observed that microplastic particle exposure reduces the abundance of Bacteroidetes and Proteobacteria at the phylum level, while increasing the abundance of Firmicutes significantly – and that within only 1-2 weeks of exposure to an albeit high concentration of either 0.5µm or 50µm sized polystyrene microplastics. Note: This is a relevant effect, because previous studies have linked high Firmicute levels to the development of T2DM and obesity (Lye 2006). Take-home message #1: Size does matter! In a 2018-study by Jin et al. only the submicron polystyrene particles (size 0.5µm) increased the intestinal inflammation in lab animals. But potentially obesogenic and pro-diabetic effects due to changes in the microbiome cannot be excluded for either very small or rather large MP particles. Table 1: This overview of the existing studies on MP concentrations in freshwater world-wide shows three things: (a) The microplastics are ubiquitous, (b) their concentration varies according to location and is compared to the concentration that has been used in experimental animal studies very low, and (c) we know very little about the supposedly most dangerous ≤ 50 µm (let alone ≤ 5µm) particles (Table from Eerkes-Medrano 2015). The results of the recent Chinese studies do thus suggest that the 50µm particles Schwabl. et al. found in their N=8 human subjects’ excrements could be a problem, too. In view of the fact that increased mRNA levels of IL1α, IL1β, and IFN, which signify an increase in intestinal inflammation, were only observed in the guts of those animals that were exposed to the small(er) 0.5µm molecules, the statement “the smaller, the worse” still holds. Unfortunately, we don’t know anything about the distribution of both, small (50µm) and very small (0.5-5µm) MP particles in our environment. What we do know is that we must expect geographical differences in their environmental concentration (see Table 1), which is also why Schwabl et al. included subjects from Finland, Holland, Polen, the UK, Austria, Italy, Japan, and Russia in their study. And the lack of information about the particle sizes is not the only problem with the results of the studies Eerkes-Medrano et al. compiled in their 2015 review (see Table 1). The figures in Table 1 are based on studies that used sieves with meshes that wouldn’t catch either the small or the very small microplastic particles. Hence, we are facing the important question whether the freshwaters MP levels that were measured by international scientists in Mongolia, Geneva, Lake Carda, Austria, the UK, and several German and US/Canadian rivers and lakes do not profoundly(!) underestimate the actual MP concentrations in our freshwater supply, because they miss the smaller particles, of which other studies suggest they may make up 80% or more of the plastic microparticles in our environment. Unlike the heavily discussed pilot study in humans, Jin et al. have recently actually investigated the accumulation of fluorescent polypropylene particles in the gut of their hairy (rodent) subjects; in the figure above, the upper image shows an untreated mice’s gut, the lower image show the gut of mice treated w/ 5 μm fluorescent polystyrene MP – both under fluorescent illumination (hence the only thing you see are the MPs | Jin 2019). Warning! Having a leaky gut will make it easier for MP particles to get into your bloodstream: Previous research by Schmidt et al. (2013) who wanted to use micro- and nanoparticles for drug delivery, leaves no doubt that the translocation of MPs across the brush border of the intestines will be significantly increased in patients with intestinal diseases such as IBS or Crohn’s. In view of the potentially pro-inflammatory effects of MPs that means that – provided that there’s sufficient exposure to small enough particles – the microplastic particles may (figuratively speaking) burn their way through your intestinal wall. Or, to say it in a significantly less metaphorical way: The polypropylene particles will increase the inflammation of the brush border of your gut, which will then become ‘leaky’ and allow ever-increasingly larger microplastic particles to cross the intestinal wall and appear in your bloodstream, where these tiny bastards seem to be able to wreak havoc on your organs – primarily the liver. Figure 2: Relative frequency of different microplastic types (from Schwabl’s UEG Week presentation of their pilot “poop study”). In the absence of corresponding environmental data, it is difficult to estimate how relevant our environ-mental exposure to MPs actually is. What can be said with some confidence, though, is that the exposure from freshwater reservoirs is 10^4-10^6 times smaller than that in Jin et al.’s animal studies. It may thus make more sense to look at the more recent and reliable quantifications of the MP content of water from plastic-bottles. In this context, it is worth mentioning that the main constituents of the plastic bottles and caps, namely polypropylene and polyethylene terephthalate, were also the most common plastics Schwabl et al. found in their “poop study” (see Figure 2). From the press coverage on Schwabl’s study, you will probably also remember that the eight subjects were urged to consume water from plastic bottles and PP- and PET-packaged foods. In the absence of reliable data about the latter, it does, therefore, make perfect sense to take a closer look at the microplastic contamination of beverages from plastic bottles & containers. Luckily, scientists from my home-town Münster (Schymanski 2018) have recently published a paper, in which they analyzed 38 mineral-waters for their microplastic content by means of μ-Raman spectroscopy (the results are summarized in Figure 3); and their results are bad news: Schymansky et al. (2018) found microplastics in water from every of the 22 different returnable and single-use plastic bottles, the 3 beverage cartons, and the 9 glass bottles they had obtained from grocery stores in Germany. And what’s even worse, with 5-20 µm almost 80% of these particles were several magnitudes smaller than those that were observed in freshwater reservoirs and one magnitude smaller than the particles in the stool of the subjects’ in Schwabl’s pilot study. Figure 3: Graphical summary of the results of what probably is the best study on MP content and size in beverages in Germany (Schymanski 2018) – note: unlike many previous studies, the study by Schimansky et al. was able to detect and distinguish even very small particles with a size of 5-10 µm (the poop study used a technique that’s limited to 20-50µm). In that, the surprising prevalence of small to very small particles is, as the German scientists point out, a completely novel finding, because these small particles were simply “not detectable by the analytical techniques used in previous studies” (Schymanski 2018), which relied on the same Fourier-transform infrared (FT-IR) micro-spectroscopy that was used in Schwabl’s “poop study” and were thus limited to the detection of particles larger than 50 µm. As bad as all that may sound, the actual microplastic particle numbers in the Schymanski study were relatively small (see Figure 3, left) – and only the worst offenders, i.e. the reusable plastic bottles (dt. “Mehrwegflaschen”) contained significantly more MP particles than the control water or the poop in Schwabl’s stool analysis which yielded a statistical average of 20 particles per 10g and hence only 68 particles in the total 34g stool of each of its 3 male and 5 female 33-65 year-old subjects. Take-home message #2: The concentration of microplastic particles in German mineral waters, as well as our poop, is 4-6 magnitudes smaller than the concentrations in the water that has been shown to elicit ill health effects in animal studies. Table 2: Tabular overview of the results of another recent study (Mason 2018) investigating the particle count of bottled water – the worst offenders are marked in red. Speaking of which, the Nile Red staining the scientists used is a novel technology of which even its inventors say that it susceptible to false positives (Maes 2017) and has been evaluated only against FT-R, which is less accurate and, unlike Raman spectroscopy that was used in the German study, unable to detect particles smaller than 20µm. Hence, I would take the values reported above w/ the necessary degree of some skepticism. In that, it is important to point out that the fact that the study was done in Germany appears to be of surprisingly great importance, here. Another very recent paper from the State University of New York at Fredonia (Mason 2018) that analyzed “eleven globally sourced brands of bottled water, purchased in 19 locations in nine different countries” found microplastic particle numbers ranging from 0 to over 10,000 per liter – with 95% of particles being between 6.5 and 100 um in size – drinking “Nestlé Pure Life” (max. concentration 10,390 particles per liter | see Table 2) from Amazon on a daily basis would thus be a very bad idea. In general, recent data on the lower end of the concentration of microplastics in water bottles seem to align quite well with the particle count Schwabl et al. detected in the stool samples of the eight subjects that were purportedly drinking water from plastic bottles. was correct when he predicted in an Associated Press interview that in what he called his “worst-case” scenario “all the plastic [Schwabl et al.] found is from the [=Schwabl’s] lab” (ibid). The “poop study” may have overlooked a large quantity, if not the lion’s share of small to very small particles! I’ve highlighted this before, but I think it’s worth pointing out once more: Based on the information I have at the moment, it seems as if Schwabl et al. may well have overlooked a significant number, if not the lion’s share of particles in the stool samples of their study participants. Unlike Schymanski et al. (2018), the Austrian researchers analyzed their samples by the means of Fourier-transform infrared (FT-IR) micro-spectroscopy and were thus unable to detect the small particles (<50µm) that made up the major part (80%) of the microplastic in Schymanski’s water bottles. Unless those particles accumulated in the gut lining or, even worse, the liver of the subjects, they should have made it to the subjects’ stool. After all, all articles I’ve read – and even the TV reports – emphasize that the eight volunteers drank water from plastic bottles before the stool samples were taken. On the contrary, I believe (as previously hinted at | see red box) that it is much more likely that Schwabl et al., whose work Mark Browne, an expert on microplastics at the University of New South Wales, IMHO prematurely called “[p]oor quality observations of contamination” (ibid), missed 80% of the actual particles. Put up or shut up: Even in a worst-case scenario you are yet probably ingesting and pooping out less than 1000 small MP particles per day. If we assume that (a) the poop contained small particles Schwabl et al. couldn’t measure and that those (b) made up ~80% of the total particle exposure, the number of microplastic particles in the subjects’ stool would not be in the range of 18-172 particles, but rather amount to 90-860 particles per 10g poop (for this calculation I relied on the data from Figure 4, a screenshot from the scientists original presentation at the UEG Week, which I got from the website of the German “Umweltbundesamt“). Figure 4: Screenshot of slide 8/16 from Schwabl’s presentation of their study results at the UEG Week earlier this week – I got the original presentation from the Website of the German “Umweltbundesamt“. To make our worst-case scenario complete, let’s further assume that 10%-15% of the plastic microparticles got (at least temporarily) caught up in the subjects’ gut lining (not super likely if we revisit the photograph Jin et al. made of the gut lining of their rodents in the first red box in this article). This would imply that the subjects in Schwabl’s study ingested roundabout ~1000 particles per “poop period” (probably one day). If you compare this value to the 1.5×10^6 and 15×10^6 MP particles per liter Jin et al. needed in their studies to elicit ill health effects, you will notice that the human exposure would still be 1,000-10,000 times smaller than the concentration in the drinking water of the mice. At this point, you may rightly ask whether we don’t have to account for the low(er) water intake of mice in order to avoid comparing apples to oranges… and you’re right: sort of. It seems logical that, for a fair comparison, we would have to account for the rather small quantity of water (~1.5ml/10g body weight per day) mice consume. After pondering this issue for a while, I am, however, no longer 100% sure that this is actually necessary. It is, after all, reasonable to assume that the health impact of microplastic particle exposure depends on the number of particles per gut/digestive tract volume. Now, the latter is in the milliliter-range in mice and (McConnel 2008) and the liter-rage in humans. The ~1,000 particles from my previous calculation would thus be at least ~1,000-fold more diluted in the chyme of our intestinal tract than the 9,000 and 90,000 particles the rodents from the previously referenced Chinese studies (note: I calculated the figures based on the body weight of the rodents in Liu 2018 and the mice’s average water consumption). Take-home message #3: Based on rodent studies we can only argue that the ~1000 microplastic particles from my worst-case scenario calculation pose a possible health risk if we compare the total particle numbers. If we rely on the relative particle concentration (per volume) in the digestive tract, which is 1000x higher in mice vs. man, it does yet seem to be very unlikely that those ~1000 particles pose a serious health risk for people with a decently intact gut lining – I would not, however, exclude that there may be (small) changes in the microbial composition of our microbiome and corresponding downstream effects on our gut and metabolic health. Still, at this point, I do have to admit that we cannot say for sure if the “worst-case senario MP exposure” poses an acute, a chronic or no threat at all to our health. What we can say, for sure, however, is that you want to better err on the side of caution and limit your microplastic exposure… the question is: How do we do that? One initially surprising observation from the Schymanski study was that water from glass bottles is actually more polluted than water from one-way bottles. This may be counter-intuitive, eventually, though, it is not unlikely that the contaminations the scientists observed in water from glass bottles arose over the course of the production process with the MP particles coming from plastic pipes, valves, tanks, and/or the detergents that are used to clean the inside of the reusable bottles. In that, it’s important to point out that the difference between water from the glass bottles and the control (tap-)water in Schymanski et al. was not statistically significant. The elevated MP particle counts in the reusable plastic bottles (those are the hard ones that are not crushed when you return them), on the other hand, were. Do not confuse microplastics and BPA! I can already foresee someone posting that much lower amounts of bisphenol A have been shown to exert endocrine disrupting effects in animal studies. Don’t be that guy! While microplastics can, they don’t necessarily have to contain significant amounts of bisphenol A or other plasticizers which are added to the base material to make the material softer and more flexible. This does also mean that you are running the risk of experiencing all the previously outlined health effects even if you’re using BPA-free cups, containers, shakers, and what-not. In fact, harder and thus more brittle (BPA-free) plastic containers may actually leak greater amounts of microparticles into your foods and beverages than their plasticized, softer counterparts. If we follow Schwabl’s rationale that (plastic-)bottled water is, in fact, one of the main sources of microplastic particles in our diet, the first item on our list of things you can do to limit your MP exposure is to avoid buying and drinking from reusable plastic bottles and similar containers. Unfortunately, avoiding these bottles and containers will increase the dispersion of microplastics from non-reusable packaging into our environment and thus increase the number of particles in the sea and freshwater reservoirs. Avoiding re-usable plastic bottles and preferring one-way bottles is not really a good strategy, because it will increase our overall exposure to microplastics from the (at best) partly recycled bottles and cartons these “alternatives” come in. …and don’t forget to think about the big picture: Help to increase everyone’s awareness of ways to limit our use of plastic containers, wrappings, etc., ‘vote against plastic wrappings with your money’ by simply leaving products with plastic packaging in the supermarket, reuse intact plastic containers for a reasonable timespan (esp. if you store foods and beverages for hours and days, only, that’s perfectly fine), and dispose plastic waste appropriately, so that it can be recycled. Ah, and, most importantly, don’t subscribe to the notion that you, as an individual cannot make a difference, anyway. If we all did that, this misconception will turn into a self-fulfilling prophecy and everyone’s personal efforts to limit his/her MP exposure will become increasingly futile in view of the ever-increasing prevalence of microplastics in our environment and food-chain. At this point, it seems that the most likely effect of MPs are changes in the microbiome. In view of the often overlooked possible side effects of probiotics, this does yet not mean that you must start taking supplements. Disconcerting, but no reason to panic: Based on the previously presented evidence, it seems unlikely that the eventually surprisingly low amount of microplastic particles Schwabl et al. found in what can in fact at best be called pilot study will do you, me or anyone else with a decently intact gut lining much harm. Eventually, though, the only thing we can tell for sure is that more research – both, in animal models (e.g. dose-escalation studies) and human beings – is necessary before anyone can provide a decently reliable risk assessment. After all, the absence of conclusive evidence that would support the notion that our contemporary exposure to microplastics could pose a health threat does not exclude that future studies may demonstrate that even the ostensibly low MP particle numbers in our diet can have profound effects on our immune (not tested, yet), metabolic (initially tested in animal models), or endocrine and brain/CNS-health (both not tested, yet). In the meantime, I’d advise you to follow the previously outlined strategies to minimize your personal, as well as our global, microplastic exposure, and to console yourself with the three take-home messages from this write-up: (a) size matters, the smaller the particles, the worse – unfortunately, this is exactly, where more data is necessary, as previous studies were limited in their ability to detect the small (<100µm) and smallest (<20µm) MP particles; (b) the concentration of microplastics in water bottles, supposedly one of the most important sources of MP particles, is relatively low (<200 particles per liter); and (c) based on the little research we have our estimated exposure to microplastics is several magnitudes smaller than the exposure level in animal studies, which seem to suggest that there’s a size- and dose-dependent effect on the microbiome and metabolism of mice and fish | Comment on Facebook! Eerkes-Medrano, D., Thompson, R.C. and Aldridge, D.C., 2015. Microplastics in freshwater systems: a review of the emerging threats, identification of knowledge gaps and prioritisation of research needs. Water research, 75, pp.63-82. Jin, Y.X., Zeng, Z.Y., Wu, Y., Zhang, S.B., Fu, Z.W., 2015. Oral exposure of mice to carbendazim induces hepatic lipid metabolism disorder and gut microbiota dysbiosis. Toxicol. Sci. 147, 116–126. Jin, Y.X., Wu, S.S., Zeng, Z.Y., Fu, Z.W., 2017. Effects of environmental pollutants on gut microbiota. Environ. Pollut. 222, 1–9. Jin, Y.X., Xia, J.Z., Pan, Z.H., Yang, J.J., Wang, W.C., Fu, Z.W., 2018a. Polystyrene microplastics induce microbiota dysbiosis and inflammation in the gut of adult zebrafish. Environ. Pollut. 235, 322–329. Jin, C.Y., Xia, J.Z., Wu, S.S., Tu, W.Q., Pan, Z.H., Fu, Z.W., Wang, Y.Y., Jin, Y.X., 2018b. Insights into a possible influence on gut microbiota and intestinal barrier function during chronic exposure of mice to imazalil. Toxicol. Sci. 162, 113–123. Jin, Y., Lu, L., Tu, W., Luo, T. and Fu, Z., 2019. Impacts of polystyrene microplastic on the gut barrier, microbiota and metabolism of mice. Science of The Total Environment, 649, pp.308-317. Lu, L., Wan, Z., Luo, T., Fu, Z. and Jin, Y., 2018. Polystyrene microplastics induce gut microbiota dysbiosis and hepatic lipid metabolism disorder in mice. Science of The Total Environment, 631, pp.449-458. Maes, T., Jessop, R., Wellner, N., Haupt, K. and Mayes, A.G., 2017. A rapid-screening approach to detect and quantify microplastics based on fluorescent tagging with Nile Red. Scientific Reports, 7, p.44501. Mason, S.A., Welch, V.G. and Neratko, J., 2018. Synthetic polymer contamination in bottled water. Frontiers in chemistry, 6. McConnell, E.L., Basit, A.W. and Murdan, S., 2008. Measurements of rat and mouse gastrointestinal pH, fluid and lymphoid tissue, and implications for in‐vivo experiments. Journal of Pharmacy and Pharmacology, 60(1), pp.63-70. Schmidt, C., Lautenschlaeger, C., Collnot, E.M., Schumann, M., Bojarski, C., Schulzke, J.D., Lehr, C.M., Stallmach, A., 2013. Nano- and microscaled particles for drug targeting to inflamed intestinal mucosa: a first in vivo study in human patients. J. Control. Release 165, 139–145. Schwabl, P. et al, 2018. Assessment of microplastic concentrations in human stool – Preliminary results of a prospective study, Presented at UEG Week 2018 Vienna, October 24, 2018. Wright, S.L. and Kelly, F.J., 2017. Plastic and human health: a micro issue?. Environmental science & technology, 51(12), pp.6634-6647. Yang, D., Shi, H., Li, L., Li, J., Jabeen, K. and Kolandhasamy, P., 2015. Microplastic pollution in table salts from China. Environmental science & technology, 49(22), pp.13622-13627.